Have you ever copied and pasted your content from Google Docs into WordPress only to have it show up…weird? The spacing is incorrect, the images don’t show up, the text formatting disappears, and headers don’t translate at all. You end up spending precious time–sometimes an hour or more for long-form content—reformatting every aspect to ensure it looks just right. Well, now there is a solution…Wordable. Wordable is a tool designed to allow you to instantly export a blog post from Google Docs to a WordPress post or page. It ensures raw HTML, headings, images, and tables from your Google Doc are imported with correct formatting, and clean code and images are automatically added to your media library. The tool helps content marketers, blog editors, and solo bloggers save time content formatting so they can spend more time writing. The plugin was created for content marketers out of the personal frustration experienced by content marketers. The team has since found the tool is also valuable for casual and professional bloggers, editorial teams, and agencies and has expanded the plugins’ features to meet their needs. 1. Go to Wordable.io and click on Try Free at the top right. 2. 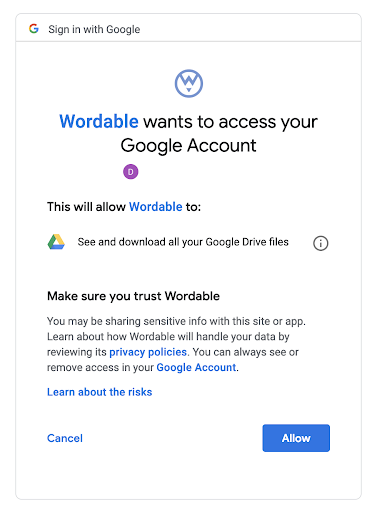 Connect your Google account so Wordable can access your Google Docs. 3. You’ll see the directions to install and activate the Wordable plugin in your dashboard. 4. Click the Download Plugin. Login to your WordPress account. Click the “Upload Plugin” button, then the “Choose File” button. 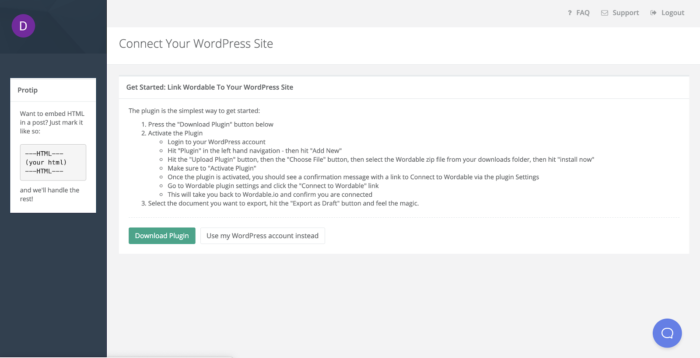 Once the plugin is activated, you will see a confirmation message with a link to Connect to Wordable via the plugin Settings. Go to Wordable plugin settings and click the “Connect to Wordable” link. This will take you back to your Wordable dashboard and confirm your account is connected. Now, back in your Wordable dashboard, select the document you want to export and click the “Export” button. You’ll see a popup asking what type of export you want to perform. Export it as a post. Click “Export to WordPress.” This will begin the uploading process. Depending on the length of the post and the number of images, this process will take a few seconds for the data to pass through. When you go to WordPress, you can find the new draft in the “Posts” section. All you need to do is give the blog post a final review before publishing. See the video below for a demo of Wordable. Wordable doesn’t support other content management systems like Squarespace, Wix, or Weebly. However, WordPress powers 33 percent of the internet, so it makes sense for the team to focus on that segment of users. Wordable offers a free trial which allows three free exports, saving you up to three hours not having to reformat your blog posts in WordPress. After the trial, Wordable costs $19 per month or $195 per year for unlimited exports to unlimited WordPress sites. These prices make sense for bloggers who publish a blog post weekly and for teams of writers or agencies that publish content at large volumes. The Wordable team provides email support delivering responses within 48 hours. The team is also available to set up referral calls with current customers if you’d like to hear an authentic client testimonial about their product. Rare for a WordPress plugin company, this extra effort demonstrates the team stands by their product and know customers love the product. As of this writing, Wordable has a 4.8-star rating on Getapp from 66 reviews from individuals who have found the tool valuable in their day-to-day jobs. Outside of the product, Wordable also has the Content Crafters interview series with content marketers and strategist who share their tactics and strategies. At the current price point, and the use case, a paid Wordable account makes the most sense for agencies and writing teams producing a high output of content and want to remove the annoyances of formatting blog posts in WordPress. For solo bloggers who publish a couple times a month, it may not make as much sense to pay for Wordable as the time savings won’t be as significant. For those who are interested in trying the product, there is a free trial of Wordable available offering three free exports. WP Media Folder Review – A Powerful WordPress Media Organizer? This post is really helpful, I will definitely try Wordable. Hopefully it will be helpful for me.